Ergonomic Design:Comfortable ergonomic handle switch to turn lights on and off, portable and light weight. Help enjoying the morning paper, read book and day life. Perfect for detailed work,children, seniors and so on. 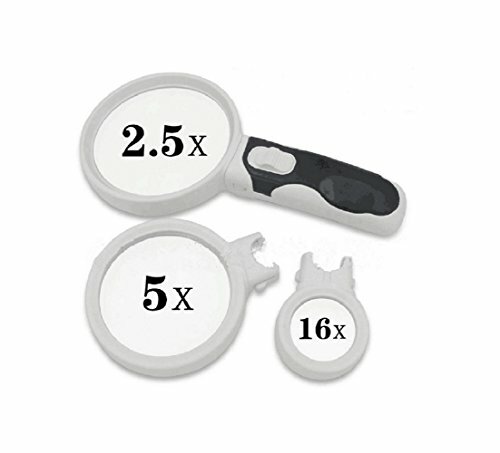 2.5x,5x and 16x lenses are changed with a simple release system. High quality glass lenses and durable ABS handle,lightweight and portable . The fast on off button turns on 2 LED lights, powered by 3 AAA batteries (not included). Size:2.5x diameter:90 mm;5x diameter:75 mm;16x diameter:37 mm. If you have any questions about this product by BabyPrice, contact us by completing and submitting the form below. If you are looking for a specif part number, please include it with your message.